These are some of the key findings from a nationwide Pew Research Center survey conducted March 21-April 8, 2013, with a representative sample of 1,983 adults, ages 18 and older. The survey was conducted on landlines and cellphones in all 50 U.S. states and the District of Columbia. The margin of sampling error is +/- 3.0 percentage points. 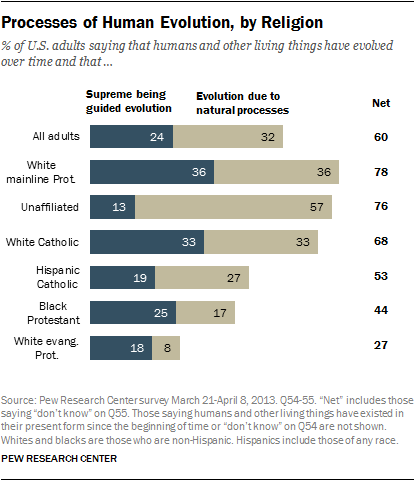 The 2013 Pew Research survey varied the exact wording of the question about evolution to better understand public views on the issue. 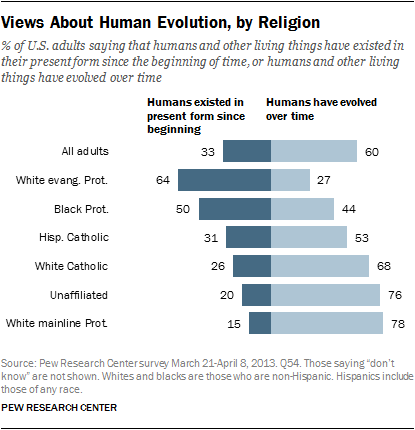 A random group of respondents was asked about the evolution of “humans and other living things” while others were asked about the evolution of “animals and other living things.”1 The survey found that the wording focus on animals vs. humans made little difference in beliefs. 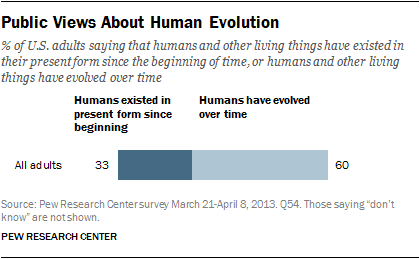 Beliefs about human and animal evolution tend to vary by gender, age and education. 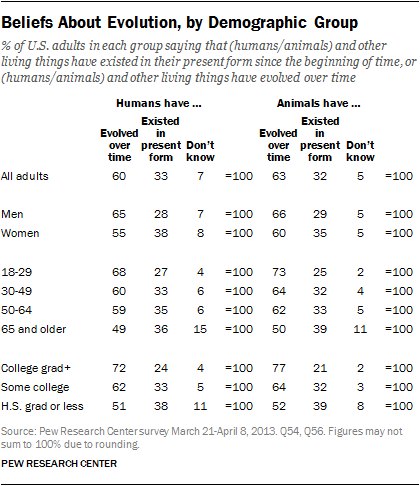 Men are somewhat more inclined than women to say that humans and animals have evolved over time. 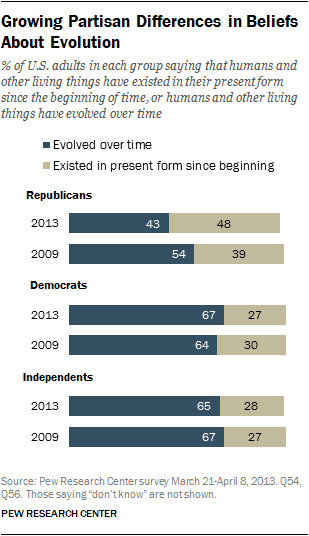 Younger adults are more likely than older generations to believe that living things have evolved over time. And those with more years of formal schooling are more likely than those with less education to say that humans and animals have evolved over time. This report is based on telephone interviews conducted March 21-April 8, 2013, among a national sample of 1,983 adults, 18 years of age or older, living in all 50 U.S. states and the District of Columbia (1,017 respondents were interviewed on a landline telephone, and 966 were interviewed on a cellphone). Interviews were completed in English and Spanish by live, professionally trained interviewing staff under the direction of Princeton Survey Research Associates International. A combination of landline and cell random digit dial (RDD) samples were used to reach a representative sample of all adults in the United States who have access to either a landline or cellphone. Both samples were disproportionately stratified to increase the incidence of African-American and Hispanic respondents. Within each stratum, phone numbers were drawn with equal probabilities. The landline samples were list-assisted and drawn from active blocks containing three or more residential listings, while the cell samples were not list-assisted but were drawn through a systematic sampling from dedicated wireless 100-blocks and shared service 100-blocks with no directory-listed landline numbers. Both the landline and cell RDD samples were disproportionately stratified by county based on estimated incidences of African-American and Hispanic respondents. The survey questionnaire included a split-form design whereby an additional 2,023 adults were asked a different set of questions, including the questions on animal evolution reported above. The total number of interviews conducted was 4,006. Thus, the data collection involved two simultaneous surveys; where the same question was asked on each form, the results of the two forms can be combined to yield a representative survey of U.S. adults with the full 4,006 respondents. Several stages of statistical adjustment or weighting are used to account for the complex nature of the sample design. The weights account for numerous factors, including (1) the different, disproportionate probabilities of selection in each stratum, (2) the overlap of the landline and cell RDD sample frames, and (3) differential non-response associated with sample demographics. Statistical results are weighted to correct known demographic discrepancies, including disproportionate stratification of the sample. The survey’s margin of error is the largest 95% confidence interval for any estimated proportion based on the total sample – the one around 50%. 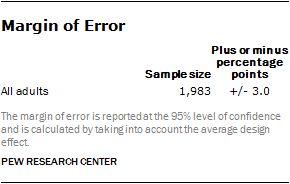 For example, the margin of error for the entire sample is +/-3.0 percentage points. This means that in 95 out of every 100 samples drawn using the same methodology, estimated proportions based on the entire sample will be no more than 3.0 percentage points away from their true values in the population. Sampling errors and statistical tests of significance used in this report take into account the effect of weighting. In addition to sampling error, one should bear in mind that question wording and practical difficulties in conducting surveys can introduce error or bias into the findings of opinion polls.